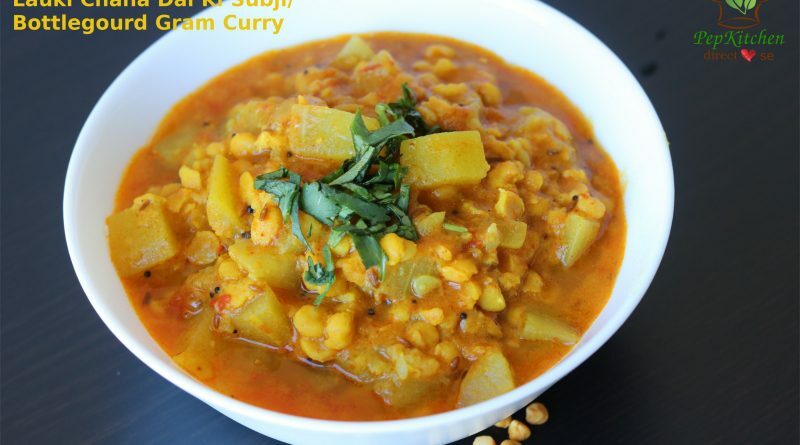 Dudhi Chana Nu Shaak/Lauki Chana Dal ki Subji/ Bottlegourd Gram Curry is a curry made as a regular everyday meal (roz ka khana) in Gujarati household. 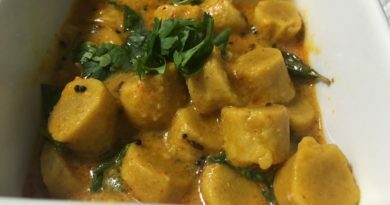 It is a delicious, protein-rich and vegan curry made by cooking Dudhi (bottle gourd) and chana dal (split gram) along with spices. Serve it with roti, bhakri, rotla or thepla for a complete, satisfying and a balanced meal. It is good for weight watchers. 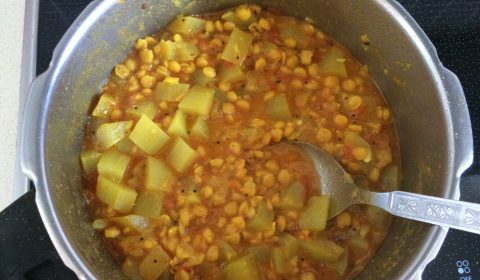 This subji is very quick to make and yet is delicious and nutritious. 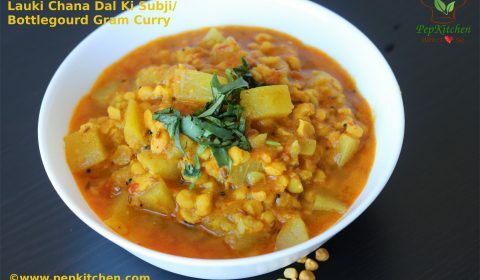 The chana dal can also be substituted with moong dal for people having gastric trouble. I have cooked the subji in a pressure cooker. Pressure cooking is quicker and retains the nutrients of the food. 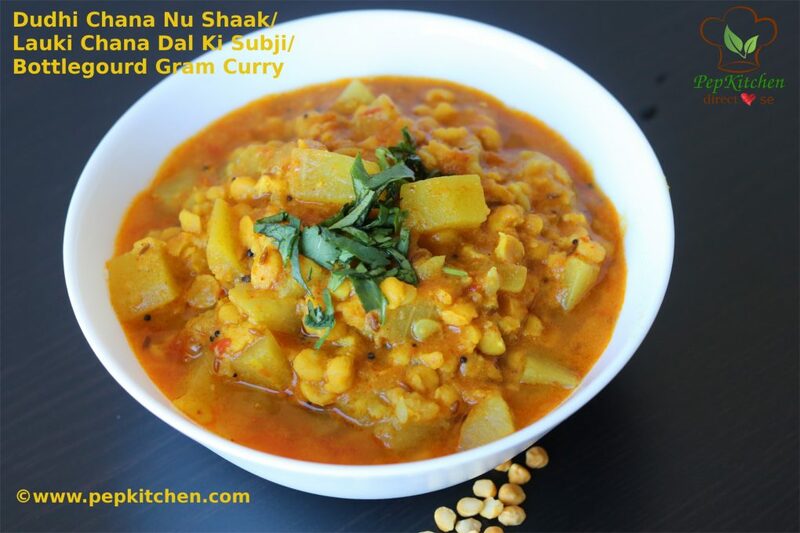 Alternatively, you can cook the dudhi chana nu shaak in a pot. It will take longer to cook and add water as necessary. You can adjust the quantity of water as per your choice. Sometimes the dudhi itself will release more water after cooking and the subji will look more watery. Just put the vessel on heat and cook till water evaporates and the consistency of subji is achieved as per your choice. 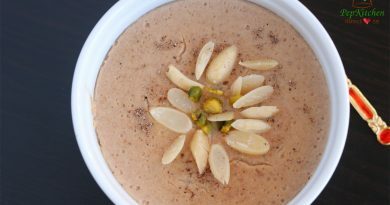 So friends do make this quick recipe and enjoy with your family and do not forget to share your reviews with me. Dudhi Chana Nu Shaak/Lauki Chana Dal ki Subji/ Bottlegourd Gram Curry is a curry made as a regular everyday meal (roz ka khana) in Gujarati household. 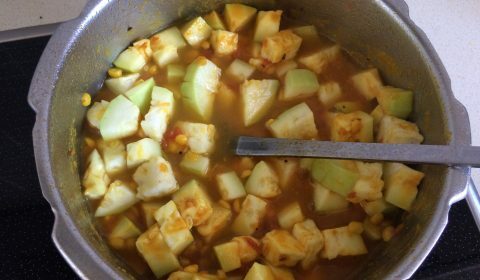 It is a delicious, protein-rich and vegan curry made by cooking Dudhi (bottle gourd) and chana dal (split gram) along with spices. 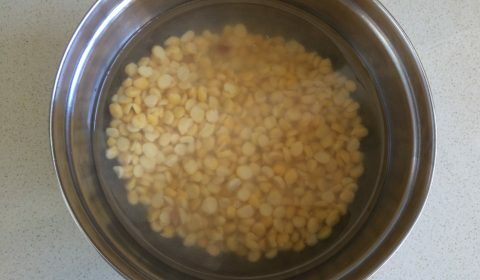 Wash and soak the split gram (chana dal) for at least one hour. Heat oil in the pressure cooker pan. 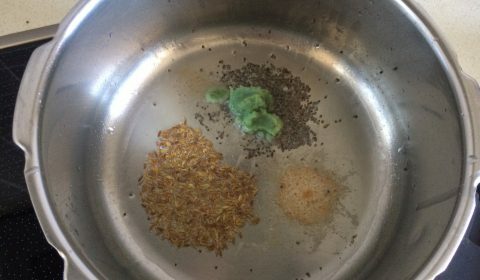 Add mustard seeds (rai) to it. When it crackles add cumin seed (jeera) to it. Then add asafoetida (hing) and ginger garlic paste. 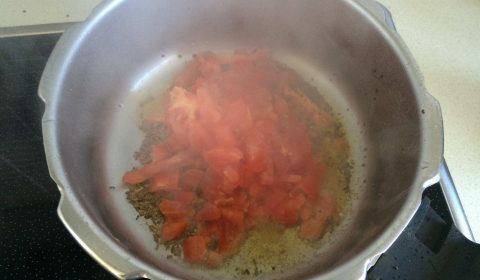 Add washed and chopped tomatoes to it. Add a little salt and cook till tomatoes soften. 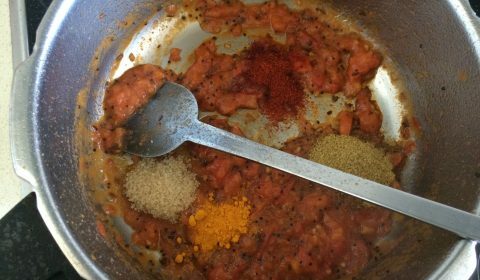 Add spices - turmeric powder (haldi), coriander-cumin powder (dhania-jeera powder), red chili powder and sugar. Saute till spices release aroma. 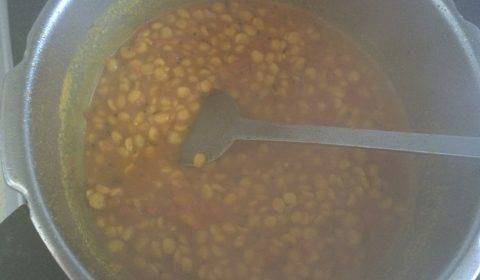 Now add the soaked chana dal and half cup of water. 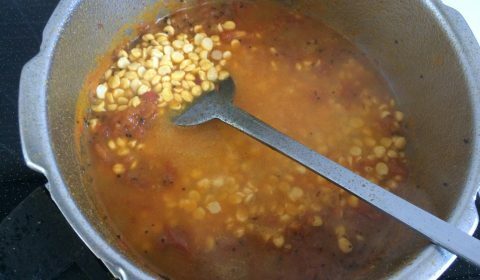 Let the water boil and dal cook for 5 minutes. 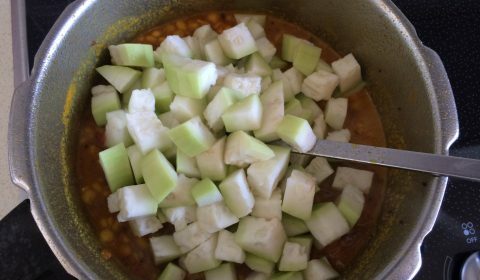 Add the chopped bottle gourd (dudhi) to it. Mix well and add remaining water and salt to it. Close the pressure cooker lid with a whistle and cook for 4 whistles on high heat and 2 whistles on low heat. Let the pressure cooker cool by itself. Remove the lid and dudhi chana nu shaak is ready to serve. 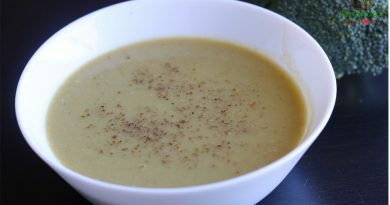 Enjoy the dudhi chana nu shaak with hot rotis, bhakri , rotla or thepla.